An easy vegetable stir fry recipe. 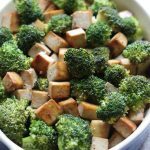 Tofu is lightly cooked in soy sauce and tossed in with tender Broccoli. Super Firm Tofu is recommended for this recipe.